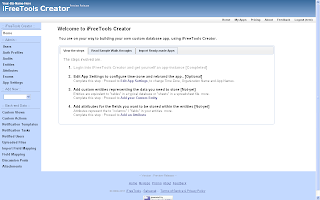 iFreeTools Creator is a multi-tenant application and getting your own app-instance is as easy as logging-in into the app. There are no sign-up forms to fill in, just use your Google Account (normal Google user account or Google Apps user account). 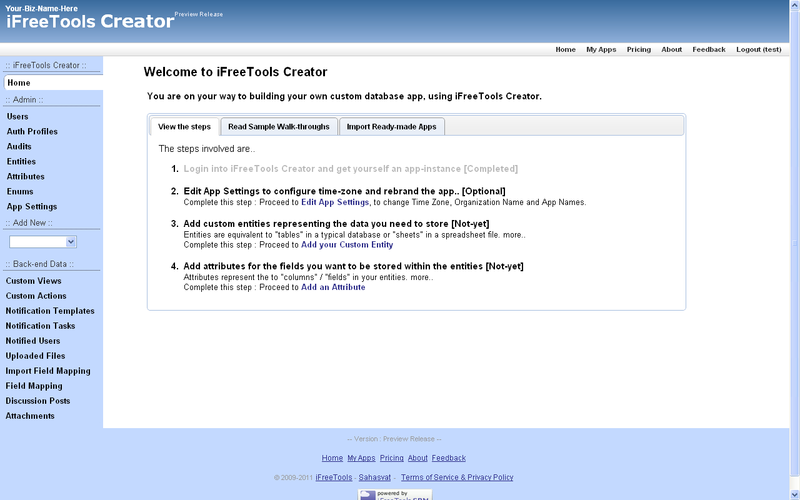 Once you login into iFreeTools Creator, the app will check to see if you already have access to any of the app-instances (yes, you can have access to more than one app-instance and its associated database). If you are not already associated with other app-instances, you will be allocated a new app-instance. You will also receive an email with the details of the app-instance. All app-instances to which you have access-to will be listed under My Apps (link available in the top-right, within the app). You can create a new app-instance too from under My Apps. Within your new app, on the home page you will find the links to the available modules on your left and the main content area will show steps on how to proceed with building your database app, as shown below..
You can click on each of those steps for more details. For example, clicking on the first step, shows the details of the app-instance created for your use, as shown below. The next step is to proceed to configure the application settings.